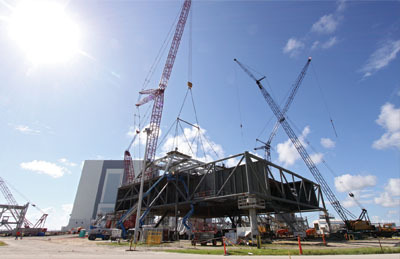 Southeast Construction magazine recently named NASA's Mobile Launch Platform at Kennedy Space Center, Florida, the Best Industrial Project in its Best Of 2010 awards program. The project -- submitted by Hensel Phelps Construction Co., in Orlando -- was detailed by The Steel Detailers, Inc., and fabricated by Cocoa Beach, Florida-based Met-Con, Inc. The NASA project was previously named winner of Best of Show in the 2009 SDS/2 Solid Steel competition. Southeast Construction's Best Of annual competition recognizes construction and design excellence in the Florida, Georgia, North Carolina and South Carolina four-state region. More than 180 projects competed in 22 categories, based on construction type. Projects deemed to be truly exceptional were given the "Best Of" award in each category. Southeast Construction magazine is a publication of McGraw-Hill Construction.